I managed to update and add lots of new stuff to my Synopsis worksheets, and they are now available on Kindle , iBooks, Kobo, Nook, and Smashwords for only $0.99. Has your fiction manuscript been rejected by literary agents or traditional publishing houses, and you're not sure why? Do you feel something's "off" with your novel, but you don't know what? Sometimes the problem isn't the writing—it's the characterization or the overall story structure. The Story Sensei’s Synopsis worksheet was designed as a way for fiction writers to not only write a synopsis, but also doctor their own manuscript by utilizing a large-scale, bird’s eye view of their stories. This different way of looking at your novel can often point out flaws in character arcs, major plot points, and overall story structure. This worksheet will guide you through writing your synopsis. Don’t have a completed manuscript? No problem—as long as you’re familiar with the main points of your story, you can still write a synopsis using this worksheet. It may even help you craft your story and fill in missing pieces as you write the synopsis. Camy uses examples from proposals for her own novels, which garnered her contracts with Christian publishers Zondervan (HarperCollins) and Love Inspired Suspense (Harlequin). There is also a special section on spiritual/internal arcs, since Christian novels tend to have strong spiritual threads in the stories. Even if your story is not inspirational, the internal arc section will help you outline a strong internal arc for your character or troubleshoot if the internal arc has some weaknesses. 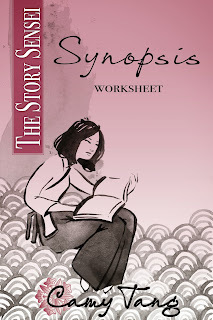 If you haven’t yet bought my Synopsis worksheet, it’s now available for only $0.99! If you bought a worksheet directly from me in the past, I'm happy to give you access to the page to download the updated version for free. Please message me and let me know the email address you used to buy it (if it’s different) so I can find your order.